Ralph (LJ Handi) first shared the book with us, here at LumberJocks.com, in a forum posting. Although I have since seen a few projects enhanced with the sand shading technique it is a relatively new technique for me and definitely intriguing. 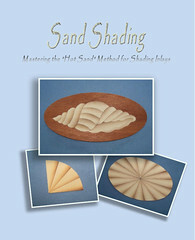 In his book, Ralph walks us through getting the equipment and sand, using some trial pieces, how the shading techniques works on different wood, how to create contours using the shading, and how to create some basic designs. Although I haven’t tried the technique the instructions and photos appear to be very thorough and easily followed. For those interested in adding a new dimension to their projects, this book would be a great resource! Thanks to Ralph (aka “Handi”) for the donation of his book.